Dress shirts are a staple in most wardrobes. Natural fibers such as cotton and silk breathe well and are good choices for the warmer months. Although silk is higher maintenance than cotton. The higher the percentage of cotton, the better the shirt will breathe, so, if you perspire heavily, cotton is your best choice. There is no right or wrong answer when it comes to starching shirts. However, there are variables on how a shirt takes on starch. The thickness and weight of the fabric will determine how much starch the shirt will hold. Poly blends do not absorb starch at the same rate as 100% cotton, therefore, you may notice a difference in stiffness depending on the type of shirt. Collars and cuffs are either sewn, which have a softer feel, or fused, which are stiffer. While sewn collars tend to wrinkle or crease more, fused collars shrink more and hold more soil. While your personal preference should govern, check the quality of construction at the time of purchase. A. The two main reasons buttons break are time and construction of the button. Over time, buttons become brittle and break from normal wear and tear. But in many cases they are made of materials that do not handle the heat involved in home or professional laundering. Sometimes the crack is so fine, it is difficult to detect. This is one of the most common problems facing drycleaners and at Anton’s we are taking extra steps to ensure that your buttons are intact. We know how frustrating it is to put on a shirt and find a broken button! A. There are a couple of possibilities. Time goes by so fast, we often fail to realize just how many times we’ve had a particular shirt laundered (some of our customers actually write the date they bought a shirt on the inside of the collar or the tail). The collar and cuffs are the first areas to show wear. Then, heavy starch can also be a factor. Wear is caused by constant bending and straightening of threads––much like constantly bending a wire. Eventually, it breaks. 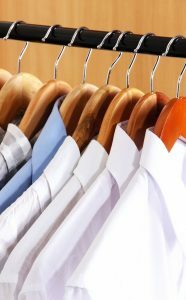 Cuffs, collars and elbows suffer from too much starch. If you like crisp shirts, ask your cleaner to use a lighter starch. Shirt collars, cuff and elbow areas are generally the first to show wear. Visually checking your clothing a couple of times a year will help avoid wear surprises. Some people actually write the date of purchase on the tails of their shirts! A. “Ring around the collar,” the phrase made famous by Wisk commercials many years ago, is a common problem with colored shirts. Perspiration, body oils, colognes, hair tonics, medicines and other types of skin preparations can all contribute to creating the famous “ring.” Many professional cleaners recognize the problem and are prepared to use special detergents for removing “rings.” They then inspect the garments to assure quality care. A. The International Fabricare Institute reports that there are many color loss complaints from consumers. The problems can result from the dyes used, body oils, and aftershave lotions, and even certain skin ointments. The loss may appear after the first washing or not until later. Some discoloration may be improved by dry cleaning the shirt to remove the dye transfer. If you are dissatisfied with a shirt, you may want to return it to the store where it was purchased, or directly to the manufacturer. A. These fabrics are known as “unbalanced weaves.” They are characterized by a basket weave construction in which two tightly twisted yarns are interlaced with a low twist. The heavier twist yarns are usually of a heavier density and contribute to the imbalance of the weave, so that the low twist yarn gives way as the result of chafing or friction. It is then that the tiny holes appear. As you can see, this might make a good trivia question! A. Our procedure at Anton’s is to inspect each and every shirt for missing buttons, “ring around the collar,” and stains. Our processing plants are equipped with special machines for sewing on buttons. If a button is missing, we replace it without charge. We know how irritating it is to put on a fresh shirt and encounter a missing button. It’s just as disconcerting to have a seemingly good one break while buttoning it. While it’s impossible to anticipate a button breaking, we’ll be sure to replace it the next time we see the shirt or blouse. A. This is an easy one. There are three reasons why whites look gray and colored shirts appear dull: 1) an insufficient amount of detergent was used; 2) the detergent was ineffective; and 3) the washer was overloaded. Some cleaners try to save time and money by cutting corners on supplies and procedures. Frankly, you’re quite correct. It’s easy to spot the difference. By the way, we are one of a very few drycleaners in our area licensed to use Sanitone™ products, including the Platinum® shirt care detergents. The difference is obvious to the eye. A. Industry standards allow for a normal shrinkage of two percent that is not usually noticeable. You can measure the collar and sleeve length to be sure it corresponds to the shirt size. Measure the collar from the beginning of the button hole to the center of the button and measure the sleeve length in a straight line from the center of the back of the collar to the end of the cuff. If there is shrinkage, it is usually due to poorly stabilized materials.